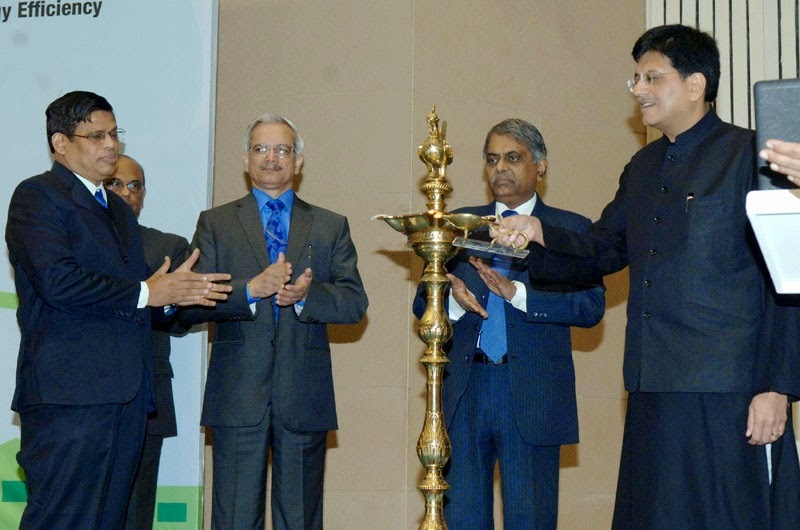 The Minister of State (Independent Charge) for Power, Coal and New and Renewable Energy, Shri Piyush Goyal lighting the lamp to inaugurate the National Energy Conservation Day function, in New Delhi on December 14, 2014. The Secretary, Ministry of Power, Shri Pradeep Kumar Sinha and the Secretary Ministry of New & Renewable Energy (MNRE), Shri Upendra Tripathy are also seen. As part of the Government’s efforts for promoting energy conservation, Shri Piyush Goyal, Minister of State (I/C) for Power, Coal and New & Renewable Energy has said that within next two years all government buildings throughout the country will be equipped with energy saving LED bulbs. The Minister made this announcement in response to a suggestion which came up during his interaction with school children across the country through video link. The suggestion was put forward by a student of St Joseph Public School, Hyderabad at the video interactive session held as part of the launch of a web portal called ‘’Energy Savers’’ ( www.energysavers.co.in) at the National Energy Conservation Day function here today. 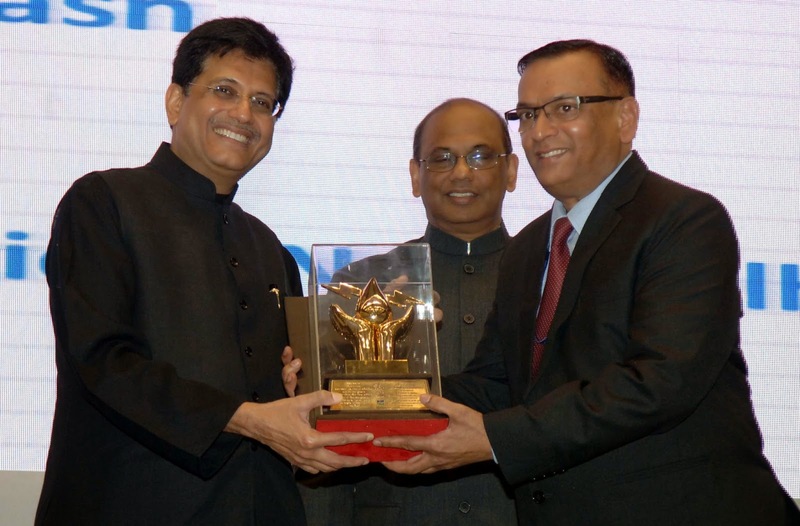 The Minister of State (Independent Charge) for Power, Coal and New and Renewable Energy, Shri Piyush Goyal launching the “Energy Savers” Web Portal, at the National Energy Conservation Day function, in New Delhi on December 14, 2014. The Secretary, Ministry of Power, Shri Pradeep Kumar Sinha is also seen. School children from 18 cities namely Bhubaneswar, Hyderabad. Shimla, Patna, Itanagar, Jalandhar, Lucknow, Pune, Bhopal, Raipur, Thiruvanthapuram, Bangalore, Agartala, Gandhinagar, Puducherry, Port Blair, Kavaratti and Haridwar participated in the interactive session. 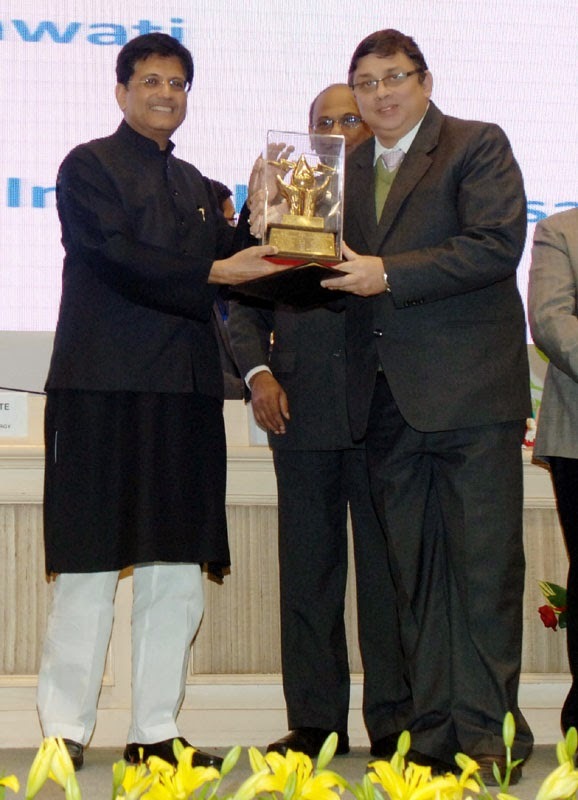 The Minister of State (Independent Charge) for Power, Coal and New and Renewable Energy, Shri Piyush Goyal presenting the National Energy Conservation Award, at the National Energy Conservation Day function, in New Delhi on December 14, 2014. The Minister said that he will take up with Ministry of Human Resource Development the idea of voluntary inclusion of Energy Management in the school curriculum . The suggestion to this effect came from a student of Government Girls Sr Sec School, Nehru Garden, Jalandhar ,Punjab, whose teacher present on the occasion assured to pioneer the idea in their school as a role model. Another suggestion , which came up from Bhopal during the interactive session, was setting up a toll free number in each state , where compliant can be registered regarding wastage of power due to not switching off the street lighting system during day time in the cities and towns. Shri Goyal directed officials to make this “toll free number” operational by 31st Jan, 2015 in all States and UTs and ensure its proper monitoring and management at all levels. Shri Goyal also accepted a suggestion put forward by students from Lucknow and Puducherry to incentivize the energy saving equipment manufacturers and levy more tax on energy guzzlers . He said that he will take up this idea with the Union Finance Minister . On another suggestion regarding promoting electric vehicles , which came up from a student in Raipur, Shri Goyal appealed to all States to make them tax free and advocated to take it as a pilot project preferably in a hilly state. 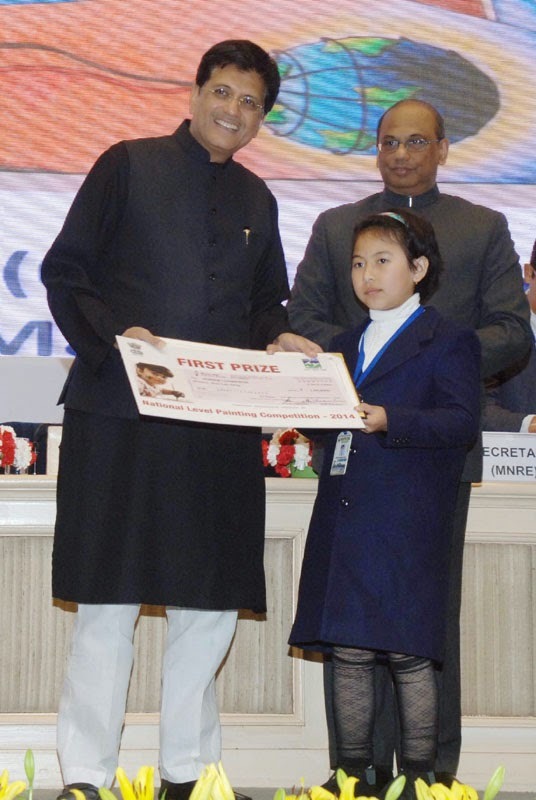 The Minister of State (Independent Charge) for Power, Coal and New and Renewable Energy, Shri Piyush Goyal presenting the National Painting Competition Prize, at the National Energy Conservation Day function, in New Delhi on December 14, 2014. A student from Gandhinagar suggested to the Minister for the replication of “ Bal Urja Rakshak Dal” Scheme being implemented in the schools in Gujarat to other States. Responding to this idea, Shri Goyal said that a similar initiative of forming “ Energy Clubs” in all schools is part of the web portal “ Energy Savers” launched on the occasion. He also invited the students to post more such ideas after debating in their schools in the interactive portal. Accepting an idea of students from Port Blair, the Minister also announced that all islands will be made “ Green Energy” Islands in the next two years. He said the Prime Minister had also emphasized for the usage of hybrid energy solutions in all Islands to achieve this goal. The Minister also announced that from the next year onwards a separate award will be given to the schools which conserve maximum energy. 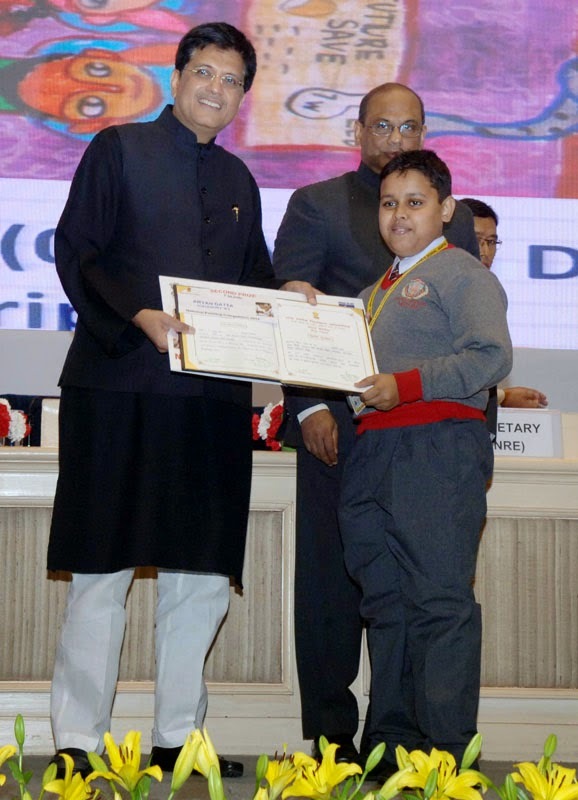 The Minister of State (Independent Charge) for Power, Coal and New and Renewable Energy, Shri Piyush Goyal discussing the energy conservation issues with the children, at the National Energy Conservation Day function, in New Delhi on December 14, 2014. The Secretary, Ministry of Power, Shri Pradeep Kumar Sinha and the Secretary Ministry of New & Renewable Energy (MNRE), Shri Upendra Tripathy are also seen. Winding up the interactive video session with the students , Shri Goyal said that he is committed to implement all the announcements made on the occasion.